TurboCAD LTE Pro V9 - Works Like AutoCAD LTE and more! TurboCAD LTE Pro is full featured 2.5D CAD that works like AutoCAD LT. But only TurboCAD LTE Pro offers more powerful features like architectural tools and simple BIM support for professional. TurboCAD LTE Pro is a full-featured 2.5D CAD software solution with advanced features and extensive file support. TurboCAD LTE offers everything you look for in AutoCAD LT, plus additional advanced features that CAD professionals want, all at a fraction of the price. If you’re already familiar with AutoCAD LT, the keystrokes, command line, and interface in TurboCAD LTE Pro make it easy to jump right in. There’s no need to re-learn what you already know. Load, process, and view even the largest CAD files using the 64-bit version of TurboCAD LTE Pro. Increase performance with the GPU-accelerated drawing engine used in conjunction with a variety of productivity tools. 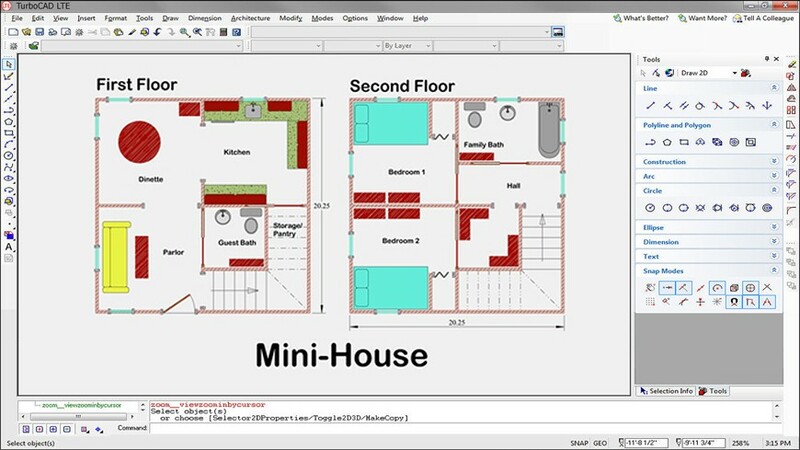 Take designs further with TurboCAD LTE Pro’s powerful drafting palette, page layout wizard, PDF underlay, support for Xrefs, parametric parts manager, constraints, entity marks, and dozens more tools and features you won’t find in AutoCAD LT.
TurboCAD LTE Pro provides architectural features you will not find in AutoCAD LT, including IFC import/export, a range of parametric, ACA/ADT compatible architectural objects, a house wizard, architectural style manager, and more. TurboCAD LTE Pro is programmable through Ruby Scripting or the Software Development Kit, allowing for customizations of the software. Create routines, features, or vertical apps to make TurboCAD LTE better suited to your specific needs. TurboCAD LTE Pro offers a superior workflow with AutoCAD and SketchUp files, U3D and 3D PDF support and dozens more popular CAD and graphic file formats. This latest release offers exciting new architectural tools, new slot tools, new point cloud tools, and much more. Plus enjoy the improved conceptual selector and new PRC support to export 3D content and share your work as a 3D PDF. TurboCAD LTE Pro is rich in fundamental drawing tools and drawing aids that speed design. More than an AutoCAD LT® work-alike; it’s a professional 2.5D CAD program that provides all the features you look for in AutoCAD LT, plus many more advanced design tools CAD professionals want. TurboCAD LTE Pro is designed to minimize switching costs for AutoCAD LT users. Menus, tools, and icons are easily recognizable. Familiar keystrokes, command line, palette interfaces and an intelligent cursor have been incorporated. TurboCAD LTE Pro also offers exceptional compatibility with the latest .DWG and .DXF file filters allowing you to continue to profit from your existing AutoCAD drawings. In addition to providing users with a familiar UI, TurboCAD LTE Pro offers a variety of features like a 64-bit version, GPU-accelerated drawing engine, and more, to enhance your productivity. TurboCAD LTE Pro goes beyond AutoCAD LT to provide more advanced drafting and detailing capabilities. The advanced drafting palette works with solid or surface models, turning 3D designs into associative 2D views and detailed sections to complete your working drawing documentation. The page layout wizard makes this process even easier with two modes to optimize the creation of 2D layouts from either an architectural or a mechanical model. TurboCAD LTE Pro even supports external references, or "Xrefs," making editing more efficient, and helping to keep drawings in synch. 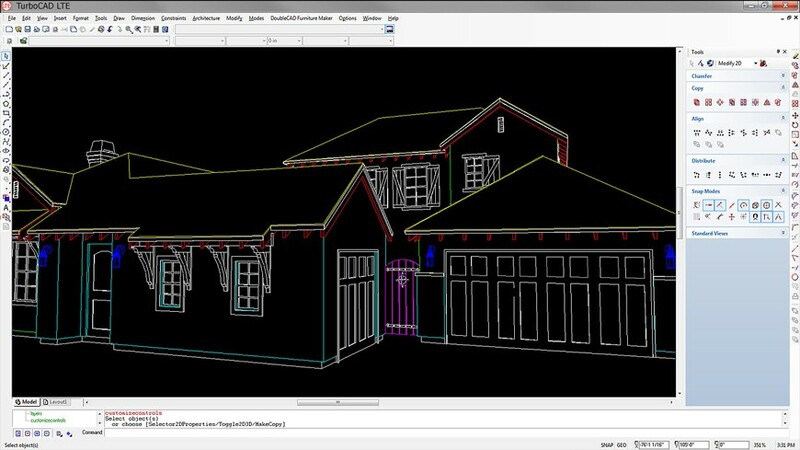 TurboCAD LTE Pro provides architectural features you won’t find in AutoCAD LT, including dynamic dimensions, markers, geo-location, a house wizard, architectural style manager, IFC import/export for simple BIM, and a range of parametric, ACA/ADT compatible architectural objects. Support for customization through Ruby scripting and the Software Developers’ Kit allows for all sorts of routines, features, or full-fledged vertical applications to be developed and added right to the user interface. TurboCAD LTE Pro supports over 30 industry-standard file formats. 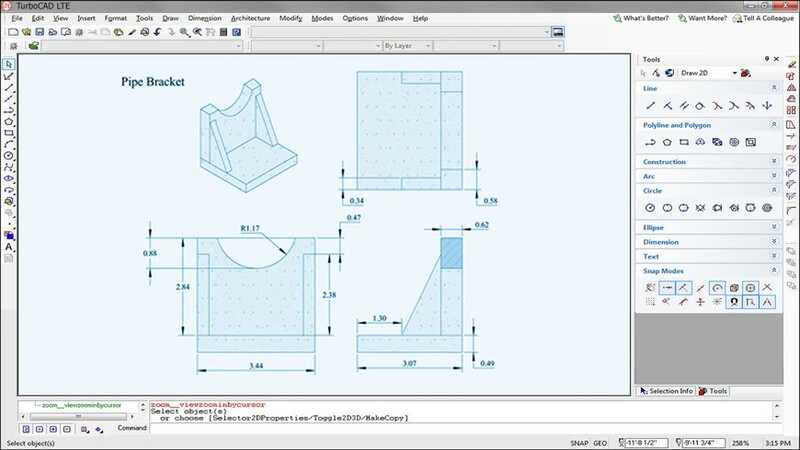 Open & save .DWG, .DXF, and .DWF formats from AutoCAD R14 to 2015. 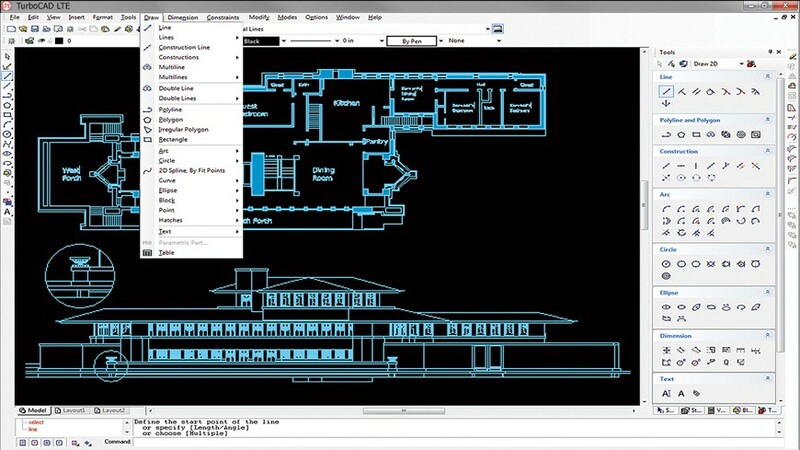 Enjoy superior workflow with Trimble MarkUp and SketchUp., now through version 2015. Import/Export files from PDF, 3D PDF, and Universal 3D (U3D) files as well as dozens more popular CAD and graphic file formats. This tool allows you to trim a Roof Slab by the plane of another object. The objects that can be used are: Other Roof Slabs, Standard Roofs, or Walls. Select the side of the roof slab to be trimmed. You can now create multi-landing stairs from a 2D polyline. The Edit Roof Slab Tool now includes an input field. The IFC file filter, commonly used for BIM operations, now supports the Import/Export of Beam object types and Column object types. The house wizard, used to quickly layout a house plan, placing and sizing each room, drop in closets, passageways, a garage, and even decking, now allows you to name each room while in the tool so you don’t have to do it after. TurboCAD LTE Pro now offers tools to interpret a point cloud, a set of data points in some coordinate system. In a three-dimensional coordinate system, these points are usually defined by X, Y, and Z coordinates, often intended to represent the external surface of an object. Import or export a point cloud using .PCD and .XYZ formats. Ability to extract a Surface from point cloud data set. The ability to select a subset of an existing point cloud and create a separate entity. This new tool allows you to easily construct isometric circles. UI enhancement which highlights 3D objects and parts of 3D objects while using certain tools in Redsdk mode including imprinting, quick pull & 3D mirror copying. Manage all your spaces through the design director including model space, and all paper spaces so you can handle spaces more efficiently than the tab interface allows. TurboCAD LTE Pro now supports both .U3D and .PRC (Product Representation Compact) file export. This new filter option exports 3D content in PRC format. TurboCAD 3D PDF export now includes support of Redsdk materials. TurboCAD LTE and TurboCAD LTE Pro are delivered in a 64-bit version to take full advantage of your hardware’s available computer memory to load, process, and render CAD files. Microsoft Windows ® 10 64-bit, Windows 8* 64-bit, Windows 7 (64-bit), Vista (64-bit) - 2 GB RAM. Your experience with TurboCAD will be greatly enhanced with a newer generation, higher speed CPU, 4+ GB RAM, and larger display resolution and graphics support. The optional GPU-accelerated Redsdk render mode requires a supported graphic processing unit (either a chip on the board, or on a video card). The latest video drivers are typically required. Newer boards with more power and VRAM generally provide greater performance.